Some of our favourite examples of the power of the unseen singer. Live opera is as much about enjoying the visual spectacle as listening. But some of the most striking effects in opera can come when composers place a singer offstage, so that we experience their presence through sound alone. The offstage voice is used to magical effect in Act III of Verdi’s Don Carlo. King Philip II has just ordered his son Carlos to be imprisoned, and commanded a grisly auto-da-fé (burning of heretics) to begin. As the crowd alternately acclaim him or lament, a single soaring soprano voice is heard, promising God’s forgiveness – a ray of light in a bleak scene (from 3:50 in the extract below). Verdi wasn't the only composer to use an offstage voice to offer celestial hope, however. Other radiant examples include the heavenly chorus who praise the Virgin Mary at the end of Puccini’s Suor Angelica as the dying Angelica is reunited with her son, the choir of angels who pronounce salvation for Marguerite in Act V of Gounod’s Faust, and the angels who come to the aid of Faust in the final scene of Boito’s Mefistofele. The effect of an offstage voice can convey a powerful sense of divine majesty. Is there anything more impressive than the bass Voice of Neptune in Mozart’s Idomeneo, when the god commands Idomeneo to save his son? Our sense of awe is amplified by the fact he’s heard but not seen. Prophets too are often rendered more impressive from being heard offstage. When we first see Jokanaan (John the Baptist) in Strauss’s Salome, he is a wretched, dishevelled prisoner. But his powerful dignity is unequivocally stated when, at the opening of the opera, his voice booms from his cell, prophesying the coming of the Messiah. Offstage voices can be as sinister as they can be consoling and awe-inspiring. 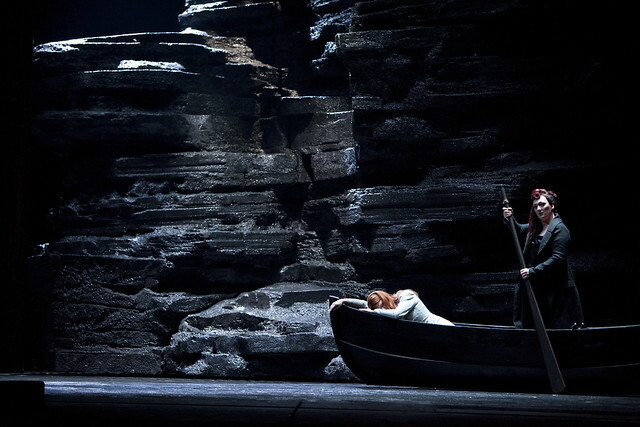 The threatening cries of the unseen crowd as Grimes wanders the shore in Act III scene 2 of Peter Grimes instil a sense of menace. Verdi and Janáček both use offstage voices to eerie effect in the storm scene of Rigoletto and extensively throughout Kát’a Kabanová (where in fact the chorus only sing onstage once in the entire opera), the fragmented voices mirroring the heroine’s gradual mental disintegration. Puccini in particular understood the power of the offstage voice to create strong character impressions and he introduces three of his heroines – Mimì (La bohème), Tosca (Tosca) and Cio-Cio-San (Madama Butterfly) – through their voices alone. Before we’ve seen them, their music and vocal qualities tell us a lot: Mimì is gentle and shy, Tosca impetuous and ardent and Cio-Cio-San is a romantic dreamer. Even before they come on stage we are eager to learn more about them. Richard Strauss uses offstage voices to particularly magnificent effect in Die Frau ohne Schatten. Throughout Acts I and II of the opera the Voice of the Falcon chillingly cries (to the rhythm of birdcalls): ‘The woman bears no shadow, the Emperor must turn to stone’. In Act I the Voices of the Unborn Children make a heartbreaking lament as Barak’s Wife determines to enter the Nurse’s demonic pact, and later in the Act the voices of the Nightwatchmen who praise conjugal love move us to pity for the lonely Barak. Offstage voices create sinister effects in the spirit realm of Act III – particularly the seductive soprano voice of the Guardian of the Threshold, who tempts the Empress to steal Barak’s Wife’s shadow. The Empress courageously resists – and the magical effect of the opera’s jubilant ending is enhanced by the Voices of the Unborn Children, who serenely reassure their parents that happy days are ahead. Of the many elements that make Die Frau ohne Schatten a great opera, the power of the offstage voice is undoubtedly a crucial one. Madama Butterfly runs 20 March–25 April 2017. Tickets will be available soon. Don Carlo runs 12–29 May 2017. Tickets will be available soon. Particular vivid use of voice! Unfortunately on this video Maestro Pappano's voice is a little offstage and feint. And then there is the heartbreaking 'Oh Lola' at the beginning of Cavallaria Rusticana.